Nickel oxide (NiO) is a versatile wide band gap semiconductor material. At present, transparent conducting oxide films find application as transparent electrodes and window coatings for opto-electronic devices but most are n-type. However p-type conducting films, of which NiO is one, are required as optical windows for devices where minority carrier injection is required. In this study, nickel (Ni) was resistively deposited on glass substrates and oxidised (isochronally) in oxygen at temperatures ranging from 300 ºC to 600 ºC. The oxidised Ni layers were subsequently characterised using scanning electron microscopy (SEM), X-ray diffraction (XRD) and UV-visible photospectrometry in the range 200 nm - 1000 nm. The four point probe method (van der Pauw geometry) was used to determine the sheet resistances of the oxidised films. SEM results of the surface revealed a strong dependence of the surface texture and particle size on the oxidation temperature and time. XRD performed on the oxidised Ni indicated progressive transformation from nanograined polycrystalline Ni to NiO at elevated temperatures. Film thicknesses, particle sizes, energy band gap and wavelength-dependent refractive indices were determined from transmission and absorbance data. Nickel oxide (NiO) is a versatile wide band gap semiconductor material. At present, transparent conducting oxide films, such as indium oxide, tin oxide and zinc oxide, are routinely used as transparent electrodes and window coatings for opto-electronic devices.1,2 These films are n-type. However p-type conducting films are required as optical windows for devices where hole injection is required. NiO is a p-type semiconductor with a band gap ranging from 3.6 eV to 4.0 eV,3 transparent to ultraviolet (UV), visible and near infrared radiation and consequently has the potential to address this need.3 A more subtle but equally important potential application of NiO is as an oxide for metal-oxide-semiconductor (MOS) devices. Recently, InAs1-xSbx has emerged as an excellent material for the development of photodetectors and emitters in the near to mid-infrared region (3 µm - 12 µm) of the electromagnetic spectrum. A number of environmentally harmful gas molecules are known to strongly absorb in this region - examples being methane (3.3 µm ), carbon dioxide (4.6 µm ), NOx (6.5 µm) and SOx (7.3 µm), rendering detector devices operating in the 3 µm - 12 µm wavelength region ideal for applications such as optical gas sensing, environmental pollution monitoring and chemical process control.4 The performance of these devices is, however, related to the nature of defect structures in the material. Deep-level transient spectroscopy is often used to characterise electrically active defects in semi-conducting materials, but requires a space charge region that can be populated and depopulated at will. This is normally achieved through a rectifying Schottky Barrier Diode (SBD) or a p-n junction device. SBDs, however, are rarely of good quality when fabricated on degenerate narrow band gap materials such as InAs or GaSb. An alternative approach is to use a MOS structure for establishing a space charge region. NiO, as mentioned, can be either a p-type semiconductor or it may, depending on the dopant defect concentrations in the material, also be highly resistive. NiO on InAs may therefore, in principle, either produce a p-n junction or a MOS device, both being suitable rectifying devices for probing the electrically active defects in narrow gap semiconductors. This study was primarily aimed at the development of an oxide (dielectric) of high integrity, to be used in an InAs MOS device. Ni layers, typically 1000-Ǻ thick, were resistively deposited onto 22 mm x 32 mm microscopic glass substrates obtained from Knittel Glaser, Braunschweig, Germany. The glass substrates were cleaned with ultra pure trichloroethylene, acetone and methanol, followed by rinsing successively in deionised water (ρ = 18 MΩcm). The samples were subsequently blown dry with nitrogen prior to loading into a stainless steel vacuum chamber with a base pressure of 2 x 10-5 mbar. The Ni shot (99.99% purity) was resistively heated using an aluminium oxide (Al2O3)-coated tungsten basket. Typical deposition rates were 2 Ǻ/s - 3 Ǻ/s. The Ni layers were subsequently annealed (isochronally) in 99.5% pure oxygen (O2) for a period of 1 h or 2.5 h (two separate series) in the temperature range 300 ºC - 600 ºC. The oxygen flow rate was 200 cm3/min and the residual ambient gases were carbon monoxide, carbon dioxide, nitrogen and argon. The annealed films were then extensively characterised in order to determine the experimental conditions required for optimal NiO formation. The structure and crystallinity of the films were investigated by X-ray diffraction (XRD) using a Phillips PW 1729 diffractometer (Einhoven, Holland). Cu Kα radiation was used. The surface morphology of the NiO films was studied by scanning electron microscopy (SEM) and the layer thickness by atomic force microscopy (AFM), while the resistivity was determined using the four point probe method in the van der Pauw geometry. For this purpose, 5 mm x 5 mm samples, with In contacts soldered on at 350 ºC were prepared. Optical measurements were performed by recording the transmittance and reflectance of the respective films using a UV-visible double beam photospectrometer in the 200 nm - 1000 nm wavelength range. 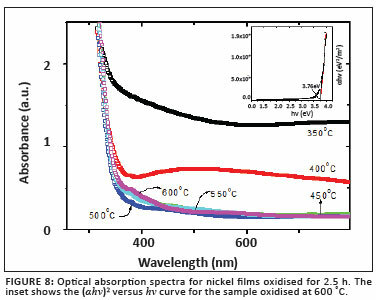 The refractive index (n), the energy band gap (Eg) and the wavelength-dependent refractive index [n(l)] of the oxidised nickel films were subsequently determined from these measurements. 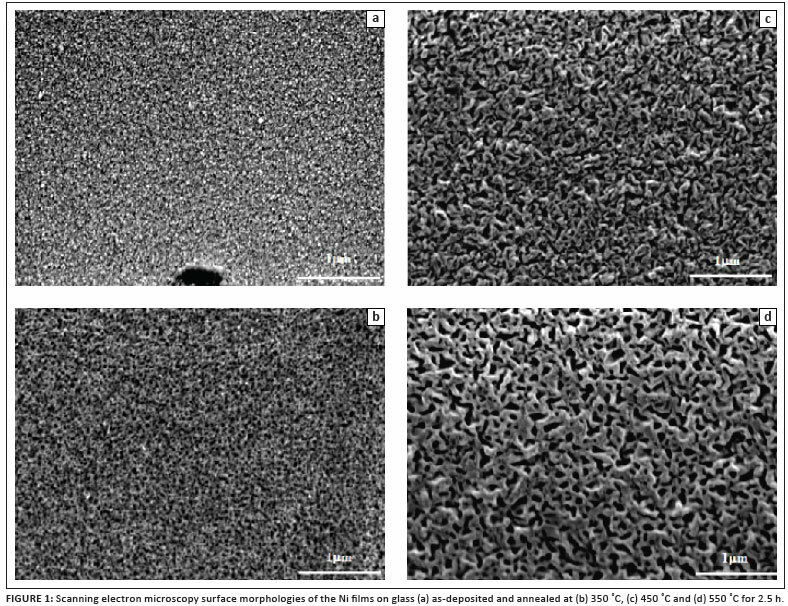 Figure 1 depicts the SEM images of the surface morphology of Ni on glass before and after oxidation for 2.5 h. The image depicted in Figure 1a shows that the as-deposited Ni layer, by comparison to the oxidised layers, is relatively smooth, suggesting that the Ni films grown on the amorphous glass substrates are most probably composed of nanosized Ni crystallites. The layer oxidised at 350 ºC revealed a rather similar, but somewhat rougher, morphology. At subsequent higher temperatures the surface morphologies became grainier. Evidently, the texture of the oxidised Ni layer depends on the annealing temperature. 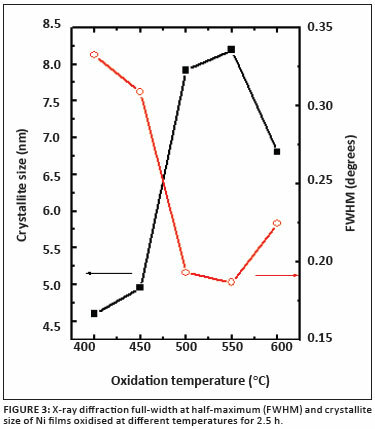 where λ is the X-radiation wavelength, ω the full width at half-maximum (FWHM) and θ the diffraction angle.9 Figure 3 shows the resultant FWHM and crystallite sizes as a function of the oxidation temperature. In order to determine the relevant FWHM values, a Lorentzian curve was fitted to the respective NiO (111) peaks at each of the oxidation temperatures. For temperatures lower than 400 ºC, the NiO (111) peaks are poorly defined or completely absent, consequently rendering the determination of particle size at these temperatures impossible. For layers oxidised at temperatures including and exceeding 400 ºC, the average particle size ranged from approximately 4.5 nm (400 ºC) to 8.5 nm (550 ºC). Crystalline 'superior' NiO layers were obtained at an oxidation temperature of 550 ºC, corresponding to the largest grain size. 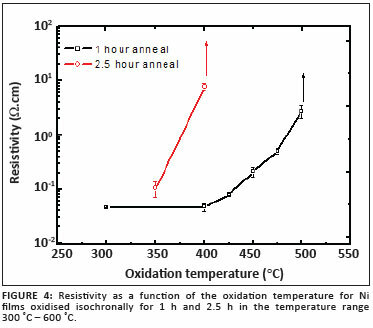 Figure 4 shows the relationship between oxidation temperature and resistivity for these films. It is clear that films annealed for 1 h at a temperature less than 500 ºC were conductive, with the conductivity decreasing significantly with increasing oxidation temperature. At 500 ºC, the resistivity increased to approximately 590 Wcm, becoming immeasurable when oxidised at 550 ºC and above. 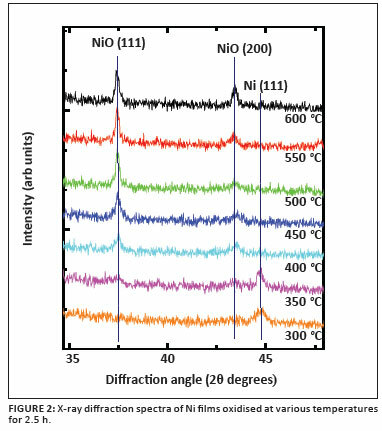 These observations are in agreement with the XRD results, confirming the oxidation of Ni to NiO, a large band gap semiconductor expected to have a large intrinsic resistivity. Ni films annealed for the longer period (2.5 h) followed a similar trend, with layers being oxidised substantially at temperatures as low as 400 ºC. For this series, the resistivity could only be measured for the films annealed at 350 ºC and 400 ºC. The increase in resistivity with oxidation temperature may possibly also be attributed to a decrease in native defects acting as shallow acceptors.10 The resistivity values obtained for NiO films in this study are in good agreement with reported values, ranging from 10-3 to 102 Ωcm.11,12,13,14 It is instructive to note that Pejova et al.15, employing the solution growth method, prepared nanocrystalline NiO films with a resistance of several mega ohms and a band gap of 3.6 eV. The transmittance spectra of the layers oxidised for 1 h and 2.5 h are compared in Figure 5. 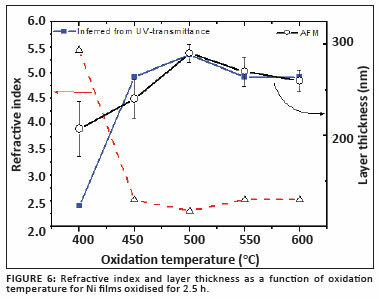 The transmittance of UV and visible light through the thin oxidised film is strongly dependent upon the oxidation period and temperature, with the transmittance being insignificant at 350 ºC, reaching a maximum of between 70% and 80% in the wavelength range 500 nm - 1000 nm for films oxidised for 2.5 h at 450 ºC. 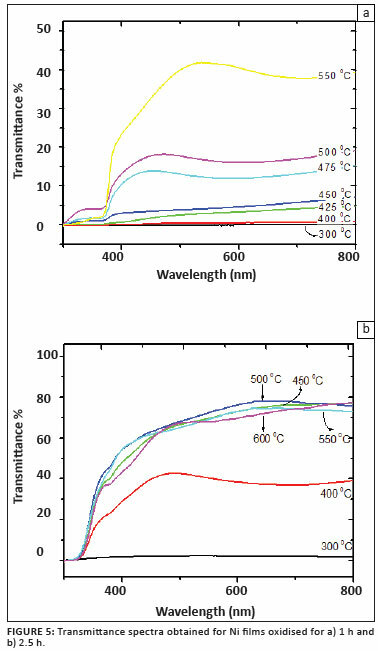 This is comparable to, and in some cases exceeds, most transmittance values reported for NiO thin films prepared by similar growth techniques.12,13,14 An increase in the oxidation temperature to 600 ºC had almost no measurable effect on the transmittance. Comparing the transmittance spectra at an oxidation temperature of 450 ºC revealed that films annealed for 1 h exhibited a maximum transmittance of approximately half (40%) of that observed for films oxidised for 2.5 h, confirming the transformation from a metal (highly reflective Ni) to a wide band gap semiconductor (transmissive NiO). It is interesting to note that the band edge region showed additional features (Figure 5). These are most probably related to defects in the films. where m is the order of the transmittance minimum and λ the wavelength at which a transmittance (or reflectance) minimum (or maximum) is observed. where a,b and c are constants to be determined from the refractive indices calculated (as explained above) from the transmittance spectra for the first-, second- and third-order minima, respectively. N is the estimated refractive index at 550 nm, determined from the dispersion equation by substituting values for n(λ) and λ corresponding to the first-order transmission minima of the film. The wavelength dependent refractive index determined in this way is shown in Figure 7.
and n1 is the refractive index of the oxidised Ni film and n2 the refractive index of glass. The optical absorption spectra for Ni films oxidised for 2.5 h are shown in Figure 8. Strong absorption is observed in the UV region as a result of the band gap of NiO. resulting in Bhv = BEg when (αhv)y = 0. Here hv is the photon energy, α is the absorption co-efficient, B is a constant related to the material and y is either 2 for a direct transition or ½ for an indirect transition. Figure 8 is a plot of (αhv)y versus hv for the sample oxidised at 600 ºC for 2.5 h. Extrapolating the linear part of the curve in the high-absorption region produces a band gap of approximately 3.76 eV for this NiO film. This value is in excellent agreement with reported values for NiO films.3,5,8,10 No linear relation was found for y = ½, suggesting that the NiO films in this study all possessed a direct band gap. Figure 9 shows the relationship between the band gap determined for each of the films annealed for 2.5 h and oxidation temperature. From this graph it is evident that the expected value of 3.7 eV for the band gap is reached after oxidation at or above 400 ºC, whereafter it remains relatively constant. The slight variation is attributed to the NiO not being completely homogenous, as a result of incomplete phase transformation and/or incomplete oxidation. Nanocrystalline nickel oxide films were successfully grown on glass substrates, with optimal oxidation of the nickel occurring at temperatures in excess of 450 ºC for a 2.5 h oxidation period. XRD results confirmed the formation of cubic NiO when oxidised at 400 ºC or above. The NiO grains apparently had no preferred orientation as both the (111) and (200) reflections were observed in the XRD spectra. Grain sizes, determined from XRD results, ranged from approximately 4.5 nm (400 ºC) to 8.5 nm (550 ºC). Resistivity values obtained for the oxidised Ni films are in good agreement with reported values for films oxidised between 450 ºC and 600 ºC. 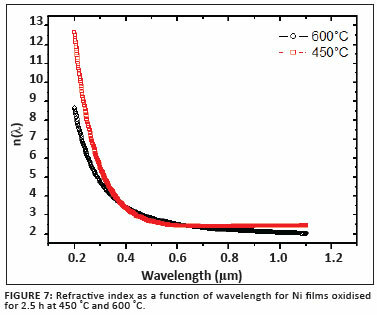 Normal incidence transmittance has been used successfully to extract the optical parameters for the evolving NiO films, including the film thickness and wavelength-dependent refractive index and was found to be very useful in that only the normal incidence transmittance (or reflectance) was required to extensively characterise the evolving NiO in terms of its optical and physical properties. 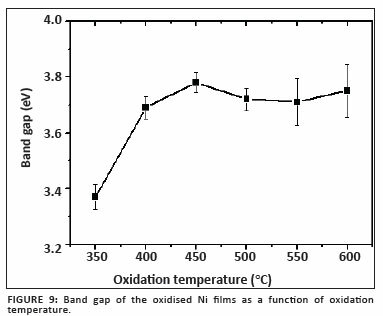 It was found that the band gap did not significantly change for oxidation temperatures exceeding 400 ºC for a period of 2.5 h, suggesting that the bulk of the film already consisted of cubic NiO. The band gap ranged from 3.37 eV at 350 ºC to 3.76 eV at 600 ºC. This work is based upon research supported by the SA Research Chairs Initiative of the Department of Science and Technology and the National Research Foundation, South Africa, as well as by the Nelson Mandela Metropolitan University. The authors also thank Mr D. O'Connor and Mr J.B. Wessels for technical assistance and Mr J. Jonker for fruitful discussions.